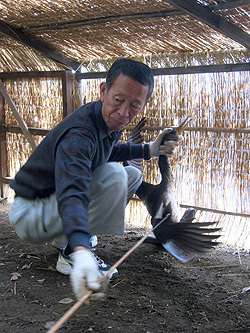 This study examined techniques of catching Japanese cormorants (an intangible folk cultural property of Hitachi City) in Jyu-o Town, Ibaraki Prefecture in the beginning of November. This was the second time this area was visited since last spring, when the aftermath of the earthquake in March was investigated. 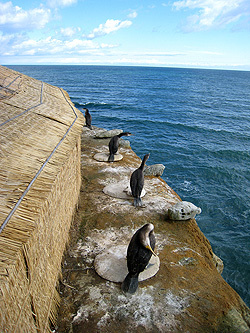 Since the study took place midway through the autumn cormorant season, the actual techniques used to catch cormorants were observed and recorded. Cormorants in flight are lured in by using several cormorants as decoys. They are then hooked with a long bamboo pole, placed in bamboo cages with their bills fixed with a little wooden implement called a Hashikake, and sent to cormorant fishing sites all over Japan.